The Douglas Dentistry team is ready to provide you and your loved ones with friendly, comprehensive dentistry. 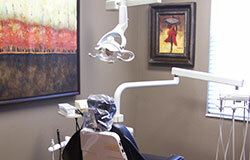 We offer a wide range of dental treatments right here in our friendly office so you don't have to drive all over town! We look forward to meeting you and your family. Are you dissatisfied with the appearance of your smile? We offer a number of treatments that will have you smiling confindently again. Find out how easy it can be to get the smile you've always wanted. Custom dental implants at Douglas Dentistry will allow you to replace loose or missing teeth so you can smile with confidence again. 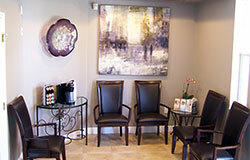 Dr. Douglas is trained to create and place implants right here in our office! At Douglas Dentistry, we work closely with each patient to help them understand their oral health. We strive to partner with each patient in the life-long pursuit of a healthy, happy mouth! 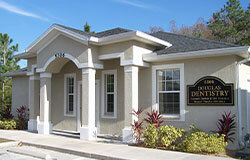 Welcome to Douglas Dentistry, your family dental practice in Lutz, Florida! From the moment you walk through the front door of our new and modern office, you'll be welcomed warmly by our caring staff. Your time and your health really matter to us, and we look forward to the opportunity of working with you to improve and maintain your oral health. We care about what we do, so whether you come to us with a specific dental concern, or you’re simply making dental care a priority through regular check-ups and dental cleanings, we will work hard to earn your business. Take some time to learn more about our practice and our dental services. We hope you'll contact us with any questions or to schedule an appointment. You can also send us an email on our contact page!